TO SCHEDULE A TESTING APPOINTMENT OR GET MORE INFORMATION CLICK ON OUR LOGO TO CONTACT US. We offer special discount rates if you are a client of Lifestart Fitness, the Experience Triathlon group, and RDKate RD Services. Resting Metabolic Rate tells you how many calories you burn at rest. Knowing your resting metabolic rate helps us better design your exercise and diet program for healthy weight loss and sport performance nutrition goals. Dietary Intake Assessment & Nutritional Counseling is performed by a clinical registered dietitian specializing in preventive health and sports nutrition performance. This assessment looks not only at your diet but can also include state-of-the-art blood work testing that will allow us to truly customize your dietary intake to optimize to health and performance goals. 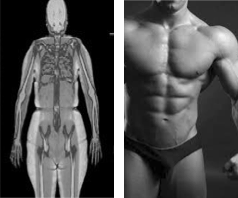 Advanced Body Composition includes a comprehensive assessment of your body weight, fat weight, lean tissue, intracellular and extracellular hydration levels, and regional lean tissue determinations. For athletes, regional lean tissue measurements help us design a resistance training program specifically built to ensure optimum upper to lower body lean tissue ratios for your sport and performance needs. Even for non-athletes, knowing your regional lean tissue numbers can help us to better design functional training programs to prevent neuromuscular injuries. Energy Expenditure Testing is the measurement of how many calories you actually use in an entire day averaged over several days. We use some of the most advanced medical and research grade technology to assess your minute by minute activity level; steps taken in a day; time spent in sedentary, low, moderate, high, and very high intensity physical activity states. 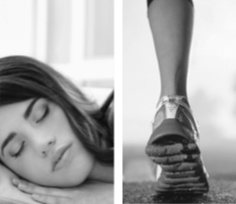 This technology helps us assess the quality of your sleep, which is a very important factor in optimizing your adaptations to training. True VO2 max determines how well your heart and lungs work to provide your body with oxygen during physical activity. VO2 max determines your aerobic fitness and is one of the best indicators of your overall cardiovascular health! So whether you are an athlete or just someone who wants to become healthier, knowing your aerobic fitness score will help us develop the best health or performance program possible. 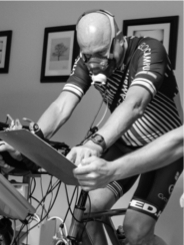 Threshold Performance Testing has been used for many years to set ideal running or cycling training paces; more accurately set your heart rate or cycling watt zones; and establish the ideal fitness training goals for helping you to improve your fitness, get leaner, and promote optimum health. With threshold testing, we can develop scientifically sound training programs based on current fitness and performance levels and help athletes perform at the highest levels. Fitness & Sports Performance Consulting provides a comprehensive assessment of your current training practices and goals. After determining your short and long term performance goals, simple step by step guidelines or a specific day to day training plan designed to help meet your next personal best training goals can be developed for you. When you enroll in our sports performance counseling program, we will carefully monitor your training progress, collect performance data along the way, compare your progress at regular intervals, and adjust your training program as needed. are offered by ENLLC to help you determine more accurately proper micro-nutrient and antioxidant intake needs resulting from your current dietary intake choices. This testing can help properly adjust your dietary intake for promoting better health and helping you with the unexpected stresses of life or during intense exercise training that can truly push your body to upper limits. In addition, we perform both standard blood lipid testings along with a highly advanced blood lipid test called lipoprotein profiling. Our advanced blood testing through SpectraCell especially helps people understand their current blood lipid related cardiovascular risks levels that standard blood lipid testings alone cannot provide. This testing is helpful to people who have a family history of heart disease or diabetes, have been diagnosed with heart disease or diabetes, are already taking cholesterol-lowering medications, have been diagnosed with Metabolic Syndrome (high blood pressure) which includes being obese, high LDL, low HDL, and/or high triglycerides. For our blood testing options, most testing can be covered under your normal medical insurance benefits minus the basic standard co-payment for a given test procedure. For more information about SpectraCell Blood Testing click on the following link to read about their testing options click here. To schedule a blood testing consult, click on our info request page.